I used this 【Ropot automatic cooker】 and made this stir fry with Saute function and less than 6 minutes. 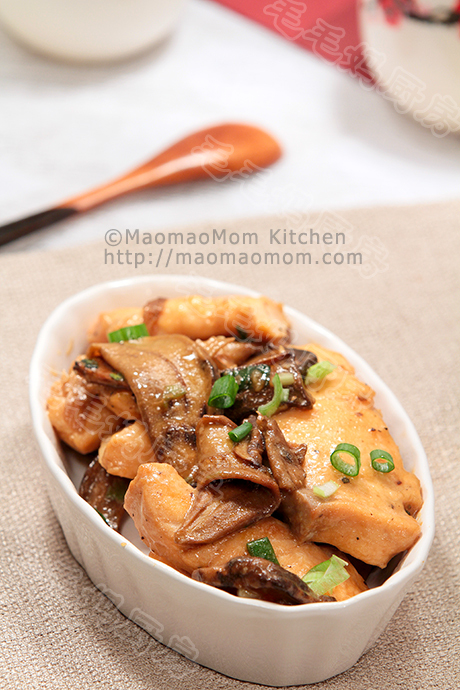 Fish is tender and mushroom is delicious, most importantly it is free of oil fumes during the cooking. 5) ½ tsp ： sesame oil. 1: Ahead of time soak mushrooms in cold water until soft, wash and drain. Rinse salmon with cold water and pat dry with papertowel, slice into 4 mm thick pieces (Picture 1), place them in a clean bowl, add all the rest ingredients of Ingredient 1), mixt well and let stand for 10 minutes (Picture 2). 2: Power up the Ropot cooker, press Power button to let it preheat. Add 1 tbsp Avocado oil, sliced ginger, chopped green onion, minced garlic and sliced mushrooms in the cooker. Close the lid, press Function to select Saute function, after 3 seconds, the program starts. 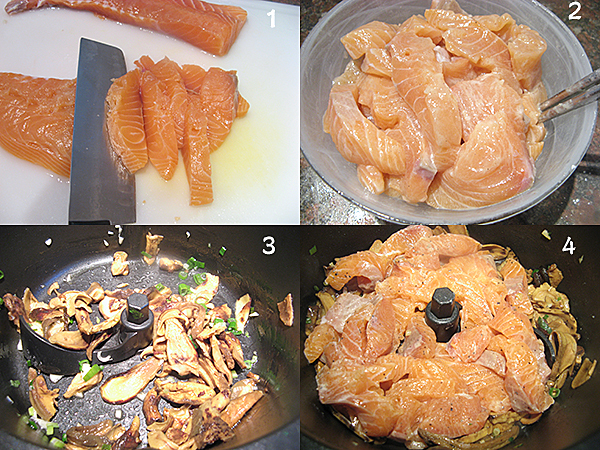 3: When Saute program ends, open the lid (Picture 3), add evenly sliced salmon to the cooker (Picture 4) and all ingredients of Ingredient ), close the lid, press Function to select Saute function, then press – sign to decreas 30 seconds of cooking time. 4: After 2.5 minutes when the program ends, open the lid and add ½ tsp sesame oil, press Toss button to mix. 5: When the Toss program ends (15 seconds), remove the pot and transfer to a serving plate and serve with some steamed rice.